Located 35 km. away, the Al-Mizawaka Tombs date back to the Pharaonic period. The most important are the rock hewn tombs of Pelusis and Petosiris. 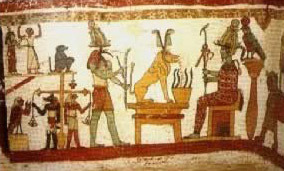 While the tombs are decorated in traditional Egyptian fashion, Petosiris is dressed as a Greek, and there is a bull on the ceiling from the Persian Mithras cult.